Home News Is East Walnut Hills the next big thing in Cincinnati neighborhoods? Is East Walnut Hills the next big thing in Cincinnati neighborhoods? Over the past several decades Cincinnati has seen its core neighborhoods change. Some of these changes have been negative while others have been very positive. The positives started with neighborhoods like Clifton and Mt. Adams, continued on to Northside and Oakley, and then onto Downtown and Over-the-Rhine (twice). While progress continues to be made in Over-the-Rhine and Downtown, the question remains: Which inner-city neighborhood might be next on the revival block? Some business and property owners in East Walnut Hills believe their beloved neighborhood is indeed the next one in line. This could be true for several reasons. The first being, location, location, location. 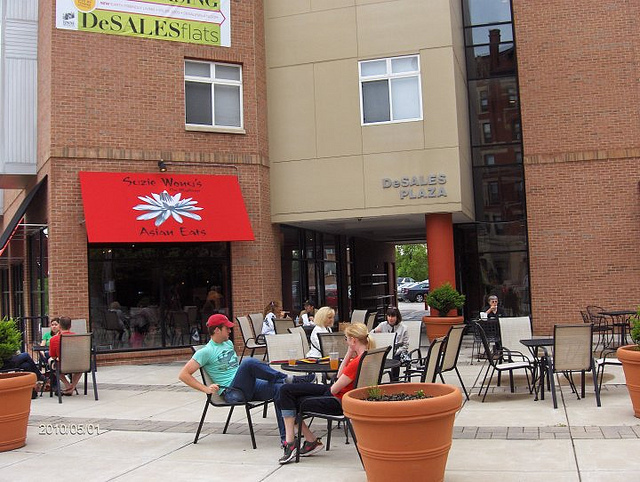 East Walnut Hill’s DeSales Corner was historically Cincinnati’s second most prominent business district outside of the Central Business District downtown. The neighborhood’s central and nearby location to downtown made that true historically. In addition to these still relevant truths, the addition of I-71, one of the city’s most prominent east/west bike routes, and the prospect of a modern streetcar line running through its heart make the neighborhood’s location even better today as people and business return to cities. One such business owner is Chef Josh Campbell who knows World Food Bar in Over-the-Rhine, Mayberry and Mayberry Foodstuffs in Downtown, and the recently opened Skinny Pig restaurant in East Walnut Hills. “In this area you have Blue Cross Blue Shield, St. Ursula Academy with students who can go off campus for lunch, and several doctor’s offices filled with people looking for healthy, flavorful food options,” Campbell explained to UrbanCincy in April 2011. In addition to businesses and students, East Walnut Hills also is situated between investment expanding east from Uptown and west from Hyde Park and Oakley. Campbell’s not the only one thinking East Walnut Hills is the next big thing when it comes to Cincinnati neighborhoods though. In April 2011 Cincy Coworks tripled its size and relocated to 2400 Gilbert Avenue nearby in Walnut Hills based on its location and affordability. There are also hundreds of new residents living at The Residences at DeSales Plaza and the recently completed DeSales Flats development. Within the past year the City of Cincinnati has also invested in new streetscaping to clean up the business district and hopefully spur additional investment in the area. While East Walnut Hills appears to be sitting pretty, it certainly is not the only neighborhood poised and ready for a renaissance. Other contenders include Mt. Auburn, Clifton Heights, North Avondale, East End, Pendleton, Corryville and West Price Hill. Which of Cincinnati’s 52 neighborhoods do you think will become the next big thing?